We call Mary's death "falling asleep" because although she really and truly died, pious tradition holds that her death lasted only 40 hours. 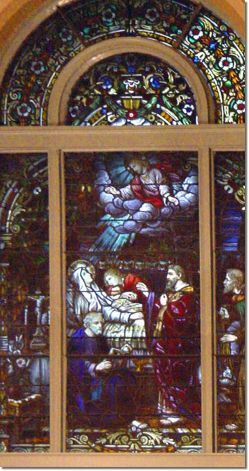 The apostles were near her, as the window depicts. Pious tradition holds Mary's death to be at the age of 72. It is interesting that in this window there is a crucifix near Mary's deathbed. It's a pious thought that Mary and the Apostles probably reverenced a crucifix just as we do. Could Mary have seen crosses with her Son's image on it? How did it make her feel?